Summer rainstorms are vastly underrated. 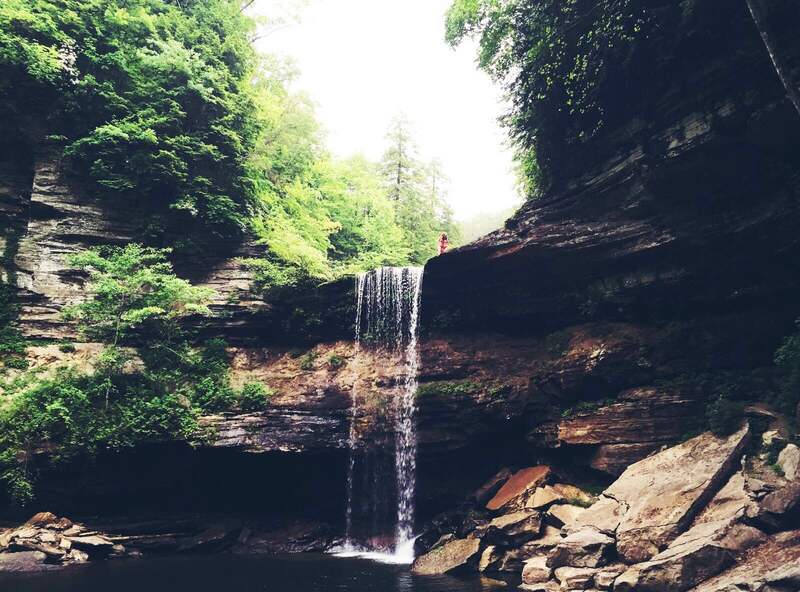 Our destination of choice was Greeter Falls in Grundy County, which, if you’re familiar with rural Tennessee, is located in the absolute middle of nowhere about an hour and a half southeast of Nashville. We talked religion and baristas and farmers along the way, and I was reminded why I’m lucky to call Danielle my hip, theology-loving, overalls-wearing best friend. 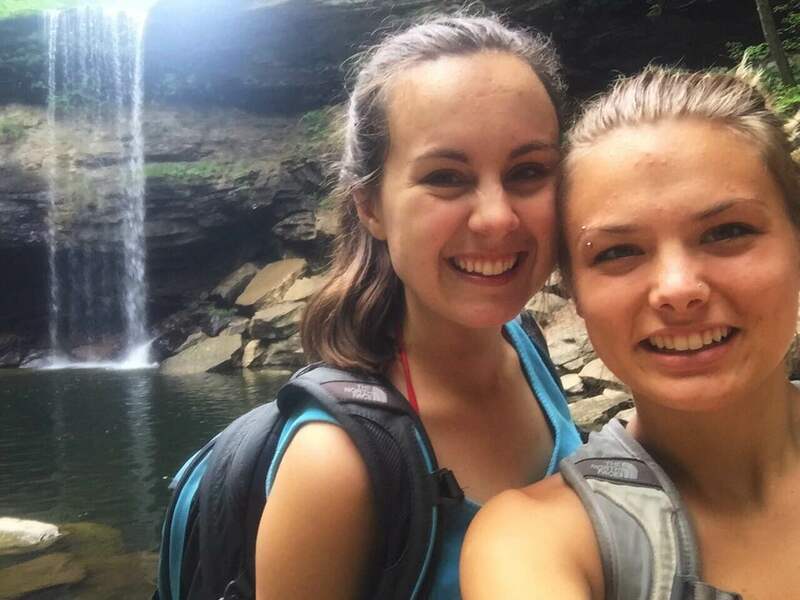 After all, it isn’t always easy to find someone who’s willing to trek to a waterfall with you in a thunderstorm – but more on that later. From the parking area, it was a 0.5 mile hike-stroll to the waterfall itself. The water was freezing cold and lovely, and we ended up making new friends and climbing back and forth up the falls three separate times to get a decent picture. The rain came later, and it made the whole day feel a lot more like an episode of Man vs. Wild than a casual afternoon swim. Danielle mentioned that this was the most “Washington thing” she’s done in a while, and for a Southerner like myself, that translates to COLD. We took advantage of the rainy weather and relative lack of people on the trails to hike to Boardtree Falls, located nearby. Danielle and I passed the time pretending we were hobbits making the treacherous journey to Mordor in the cold and freezing rain. (I mean, come on, how ridiculously dorky can you get? It was wonderful.) We weren’t completely sure where the trail led or how far we were going, but that made the whole experience all the better. There is something so raw and beautiful and marvelous about standing outside in the middle of a rainstorm and just embracing it for what it is. First-worlders shield ourselves from the elements so often, cranking up the A/C and sitting indoors when the weather is too hot, cold, or humid for our liking. I’ll admit I’m guilty of this too. But being there in the complete quiet of the forest with the rain bringing life and sustenance to everything around us, it is remarkably easy to see God’s handiwork and feel completely wrapped up in it. If you have never hiked in a thunderstorm, it’s an experience you don’t want to miss. We ended our day by scarfing down the BEST SOUP EVER from Taco Mamacita and watching (yes, I’m admitting this) the Kimye wedding special. WARNING: I don’t recommend this, as Danielle later had a dream that she and Kanye were being forced into marriage against her will. But that’s her own story to tell.